The deadline for entries to the inaugural PRWeek Global Awards has been extended to Thursday March 13. For this first year, there will be no late fee, but this date will be the absolute final deadline for entries. The Awards program is designed to identify and celebrate organizations, agencies, individuals, and companies that do outstanding cross-border work in communications. Judging will take place late this month, and our prestigious panel will be headed by Chair of Judges Andre Manning, global VP of corporate communications at Royal Philips Electronics - 16 judges have confirmed to date, comprising both in-house and agency executives. "The PRWeek Global Awards are the ideal forum to celebrate the PR industry's very best work," said Manning. "Our discipline is constantly evolving and it's important we take time to reflect on best practice campaigns and learn from their successes. As Chair of Judges I'm looking forward to hearing more about this year's entries, but I'm also hoping to identify new ideas that I can apply in my role." 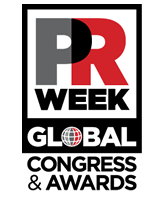 The award winners will be unveiled at PRWeek's first Global Congress, in Barcelona on May 15-16.